In 1924, three Sisters of Jesus and Mary came to UCG to study for a degree, the first religious of any congregation to do so. While they were pursuing their studies, Mother Stanislaus looked for a suitable premises for a house of studies and finally purchased “Spires House” in Shantalla on June 26, 1925. The house apparently got its name from the two unusual spires you can see on the roof. It was used by the sisters as a hostel for secular students as well as their own nuns. These nuns were known to many people as ‘The Spires Nuns’. The Sisters of Jesus and Mary later added on to this building. They added two storeys to the section we see on the left and they moved the left spire to the new gable end of the building. They also acquired Fort Eyre, the building on the corner behind this house. Fort Eyre was built by a Cromwellian officer named James Eyre. When he died he had no heir but he did have a number of illegitimate children named Maunsell. These people inherited the house and in 1822, built it up to what it is today. The road was known as Maunsell’s Road. The house stayed in the family until about 1890, when the British Army took it over and used it to house officers. They had a lot of stables there. The Maunsell family regained possession about 1920. Seán Mac Giollarnáith lived there later as did Professor Eoin and Siobhán McKenna. There is a Maunsell coat of arms over the door of Fort Eyre. There is a folly in the grounds known as ‘The Penny Tower’. It was one of those relief works organised about the time of the Famine. The workers were paid a penny a day, hence the name. There are clock faces on it so it was probably intended as a clock tower. 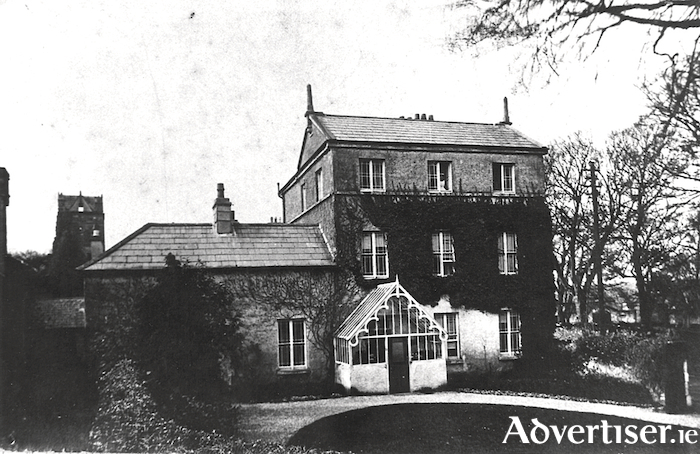 The Sisters of Jesus and Mary acquired Daly’s Fort House in Salthill in 1952 and established a school, Scoil Íde, there. They eventually knocked down the building and rebuilt a fine new school which was opened on July 22, 1962. Three years later, they opened a secondary school in a private house named ‘Salerno’ in Rockbarton. This location soon proved to be too small for the number of pupils they had and so they moved again in 1980 to a brand new building on Threadneedle Road, which they have since expanded, and recently added on a magnificent new sports hall. Those sisters have made a major impact on Galway since they arrived in 1925. Our photograph dates from c1900.